USA Financial Asset Management is an independent, SEC registered, full-service Registered Investment Advisor that offers a unique one-of-a-kind parallel business relationship & partnership with its investment advisor representatives. Our RIA can provide a value add beyond what the typical RIA can offer due to its affiliation with the other USA Financial subsidiaries (see About USA Financial). Not only do we provide excellence in the traditional RIA sense, we help our advisors to build their practice utilizing cohesively compliant and proven proprietary turnkey marketing tools, services and implementation support (see Plug-n-Run) along with an industry leading integrated technology platform (see USA Financial HQ Technology). Advisors that are properly licensed and registered can affiliate with our RIA as an investment advisor representative (IAR). In doing so, this allows them as an IAR to charge three different types of advisory fees: hourly fees, flat rate project/planning fees and/or asset under management (AUM) fees. USA Financial Asset Management provides asset under management trading & custodial services through Pershing, LLC. Pershing is a FINRA, NYSE & SIPC member and a subsidiary of The Bank of New York Mellon Corporation (BNY Mellon), the nation's oldest continuously operating bank, and one of the world's leading providers of securities services. NetX360 Trading Platform — With Pershing's industry leading, award winning, trading platform solution reps are able to manage all their brokerage trading activities including viewing account history, registration data, trade data, transfers and holdings, performance charts, and PES accounting to track cost basis data. For reps using a model portfolio strategy, NetX360 is also capable of executing block trades off any models that a rep creates. NetX360 Connectivity — Interfaces with other industry leading CRMs systems and consolidated account and performance tools, such as RedTail and Albridge (see USA Financial HQ Technology). NetX360 Add-Ons — With Perishing's open architecture and leveraged access, reps can secure additional discounted research, planning and investment tools at discounted pricing. These include respected 3rd-party providers such as Morningstar, MoneyGuide Pro, NaviPlan, Wealth2k, Argus, Credit Suisse, Dow Jones, Standard & Poor's, Thomson Reuters, MarketQ, Market Edge, ConvergEx, The Ranking Service, NASDAQ Level II (request details and pricing). USA Financial Asset Management offers its IARs two different AUM trading platforms through Pershing, a traditional WRAP fee account platform and/or a WRAP account platform that allows for discretionary trading for approved IARs (request details and pricing). USA Financial Securities — RIA offers two options for execution of asset under management account trading, a traditional "off-line" back-office trade ticket process and/or trade desk call or an "on-line" rep-office trade process with discounted ticket charges (request details and pricing). USA Financial Asset Management provides AdTrax, a streamlined compliance software package. AdTrax provides an on-line submission, tracking, and approval process of IARs' advertising material. AdTrax also archives IARs' approvals for future use and has a "sharing" mechanism for reps to share their approved advertising and marketing material with other IARs should they choose to participate. USA Financial Asset Management provides RegEd for compliance and continuing education support. RegEd provides our IARs on-line compliance meetings to meet regulatory requirements and keep pace with industry trends, while eliminating the costs and lost time of traveling to a traditional compliance meeting. RegEd provides our IARs firm element continuing education programs to meet additional industry requirements and to be knowledgeable with industry's rules and regulations, again without the costs and need of travel. USA Financial Asset Management provides AdvisorMail to provide regulatory email tracking and retention. AdvisorMail helps to reduce the time IARs and their staff would normally spend manually submitting copies of all email correspondence, email marketing & email advertising. USA Financial Asset Management has a proprietary on-line system for IARs to utilize to maintain all the necessary industry reporting logs and blotters. Our on-line system supports reporting items such as: new account opening, additional on-going transactions/trades, checks & securities, client gifts, customer complaints, marketing allowances, do not call list, and client "hold" recommendations. This system is a great support tool in the event of a regulatory audit as well as on-going business operations, as our back-office support team can help you readily access any necessary reports, logs or blotters and conduct specific product type or client searches on your behalf. USA Financial Asset Management provides TradeSphere as an automated software program designed to ensure that investment professionals are compliant with SEC regulations when trading and investing in securities within their own accounts. TradeSphere allows IARs to maintain personal investment accounts held outside of USA Financial Securities' advisory relationship with Pershing Advisor Solutions should you so choose. USA Financial Asset Management does not believe that suitability can simply be handled at a high-level such as by product type or institution, therefore we review and handle suitability at the individual client transaction level. Our suitability review team and registered principals are fully licensed and cross-trained in both securities and insurance products and strategies to insure that they can review the suitability of each transaction with a much broader view. Based on the decision regarding the SEC's 151-a proposal, we do not believe indexed annuity products are securities; however according to FINRA's Notice to Members 05-50, we do review each such transition for suitability to provide the necessary protections to both the client and the IAR. 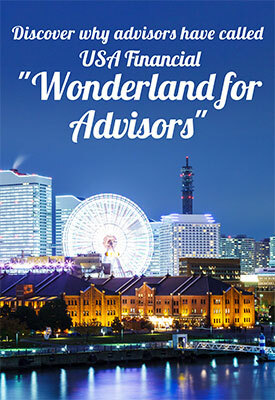 In order for USA Financial Asset Management to provide such suitability review with the least hindrances and interruptions for the IAR and client, therefore creating the most conducive business environment, all indexed annuity sales are to be transacted with our insurance wholesaler affiliate, USA Financial Insurance Services. Fixed annuities and indexed/fixed life insurance are not currently required to be reviewed for suitability at the RIA level. Even though we are providing suitability on indexed annuities, there is no "haircut", or running of IAR commissions through a payout grid, on either indexed annuity/life or fixed annuity/life products. USA Financial Asset Management offers its reps a competitive payout structure based on a reps affiliation level with the USA Financial subsidiaries (see About USA Financial) and the combined production between USA Financial Asset Management and its affiliates. In other words, USA Financial Asset Management will take into account all sources of production to determine your payout, including counting your fixed/indexed annuity/life production even though it doesn't actually run through the BD payout grid.